You may be interested in reading Part 1 if you haven’t done so already. Ashley, Jane and Deanna (Jananna), and myself followed in the wake of those early gold miners in July 2010. 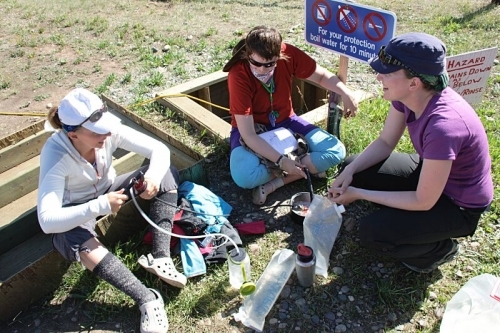 We timed our trip to arrive in Dawson City just in time for the Dawson City Music Festival. The whole trip was a great experience – so good, in fact, that Ashley and I have been talking about repeating it this summer to kick off our around the world travels. In total, the four of us spent 14 days on the river. During that time we paddled/floated 736km starting in Whitehorse and ending in Dawson City. 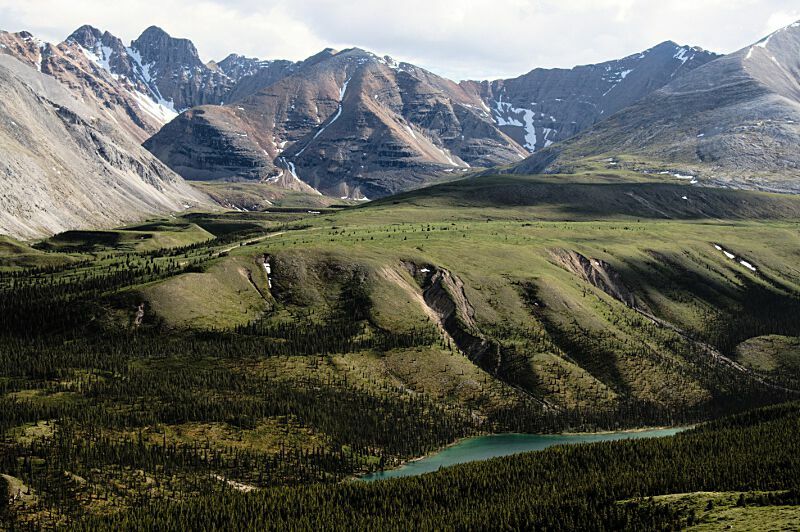 If you are looking for a shorter trip, it is possible to start at Carmacks, leaving only 416 km between you and Dawson City. This was my first canoe trip, and I would recommend it for any beginner. Portages – There were no portages! That’s right, no need to carry your canoe around waterfalls or rapids. 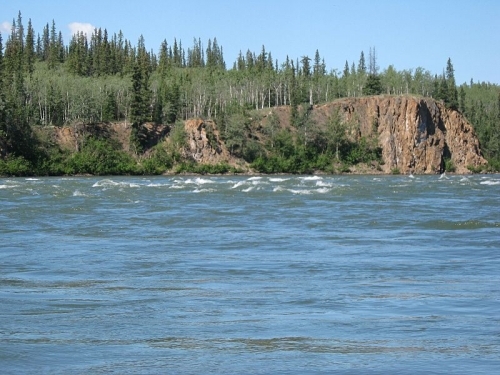 River Speed – The river flows quite quickly, with the exception of Lake Laberge where it does not flow at all. You can expect currents to carry you anywhere from 5-11km/hr. If you are not a strong paddler, don’t worry. Spend about 6.5 hours a day floating and you’ll make it where you need to go. It’s possible to complete this trip in much less time than we did. To give you an idea, the winners of the 2010 Yukon River Quest made the same trip in only 42 hours and 48 minutes. 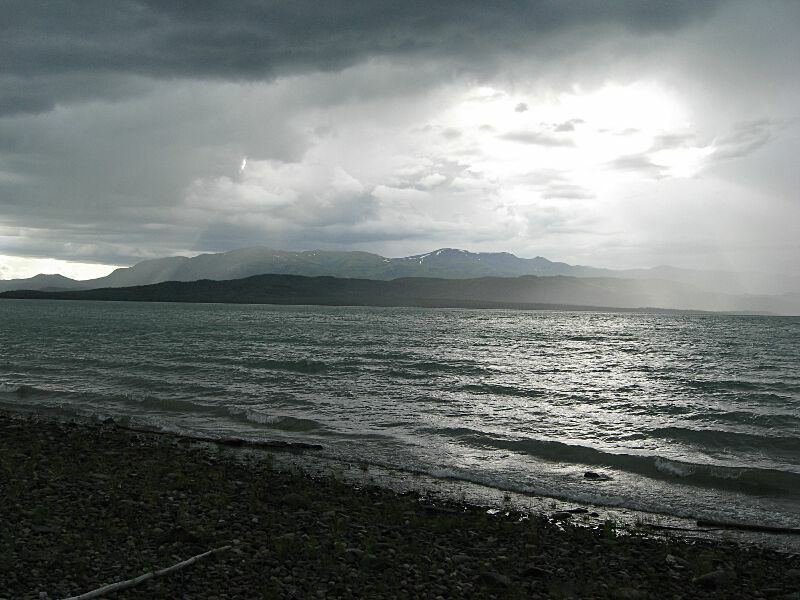 Lake Laberge – Deserves special mention. This will be the hardest and most dangerous part of the trip. The lake is 30 miles long and is prone to bad weather. Our first night on the lake, a storm came up while we had stopped to prepare supper. It took only a minute or so for the water to go from absolute calm to three foot waves. If we were caught out in the middle of the lake we would have been in big trouble. It’s important to stay close to shore. Rapids – There were two rapids shortly after Carmacks: the Five Finger Rapids, followed by the Rink Rapids. They were short and easily traversed. We drove to Whitehorse along the Alaska Highway. The highway was in good condition, and paved the entire way. Our small Civic had no problems getting us where we needed to go. 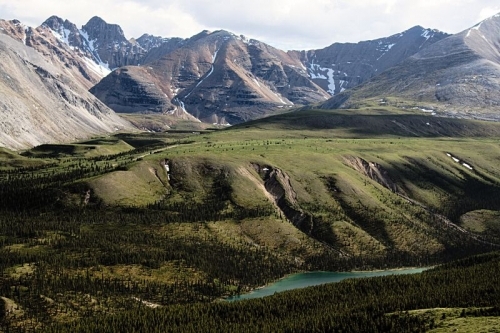 The scenery was flat and Saskatchewan-like for the first 1,400 kilometres to Dawson Creek, British Columbia. That stretch was a long boring drive. After Dawson Creek, the remainder of our drive through beautiful British Columbia and the Yukon was stunningly gorgeous. Some of my favourite photos from the entire trip came from Stone Mountain Provincial Park where we did some day hiking and spent the night. Another beautiful area was near Muncho Lake in BC. 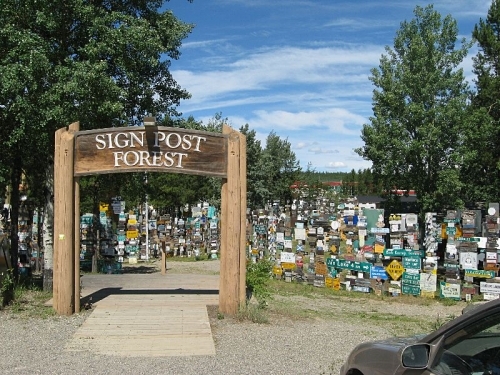 We also stopped a while in Watson Lake, Yukon to check out the famous Sign Post Forest. Supposedly this was the location of the first signpost showing distances and directions to major world cities. Since then, Watson Lake has allowed anyone to contribute their own sign to the collection and they now have thousands of signs hung up on display. We didn’t have a sign with us, but if we drive by here again, we’ll be sure to bring one. All totalled, we logged 2,824km by car over 3 days getting to Whitehorse. Jananna flew into Whitehorse directly. Obviously we took a canoe from Whitehorse to Dawson City. Getting back to Whitehorse we booked a flight through Air North for about $150 each. Although there is a highway connecting Dawson City to Whitehorse, there is no public transportation between the two, and chartered van rides cost as much as air tickets. Because we were in Dawson City for the music festival, in retrospect, we should have hitchhiked from Dawson City back to Whitehorse and saved the $150. Within minutes of attending the festival, we met several people from Whitehorse who offered to give us rides after the festival. Many people also offered to take our gear back to Whitehorse so we could avoid overweight baggage charges on our flight. We took two different guide books with us on the river. Yukon River (Marsh Lake-Dawson City) by Mike Rourke. The maps were to scale, and very well detailed. Potential campsites were marked, and there was information on a few hikes adjacent to the river. If you are only bringing one guide book, this is the one we recommend. Exploring the Upper Yukon River by Gus Karpes. Ths guide book came in two parts. It contained hand drawn maps as used by the steam ships over 100 years ago. These maps were fine in some areas, and unrecognizable in others. I would not rely on them as my only set up maps. On the other hand, the books were filled with stories about the river and identified historically significant sites. We rented our Canoe from the Kanoe People for $425. This included a $75 drop fee so we could return the canoe in Dawson City. We also rented some bear spray and a food barrel. Because we drove to Whitehorse, we needed a parking spot. The Kanoe People let us park in their back yard for $25. All in all, the experience with the Kanoe People was positive and I would recommend them again. Up North Adventures are the other outfitter in Whitehorse. I have no idea how they compare to the Kanoe People, as we did not go inside. Another alternative would be to rent a canoe from Dieter at the Dawson City River Hostel. I believe this is the cheapest option for a canoe rental. Since you’ll probably be staying at the Hostel when you get to Dawson City, it’s no extra effort to return the canoe. 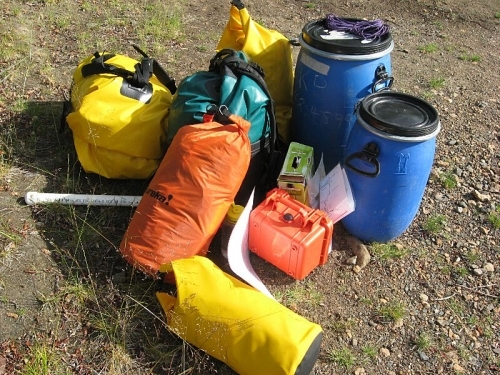 Here’s our gear list for the trip. We borrowed large dry sacks from friends, and highly recommend them. The rest of the stuff we more or less owned already. Here’s the good news: camping is free along the river, just bring your own tent. 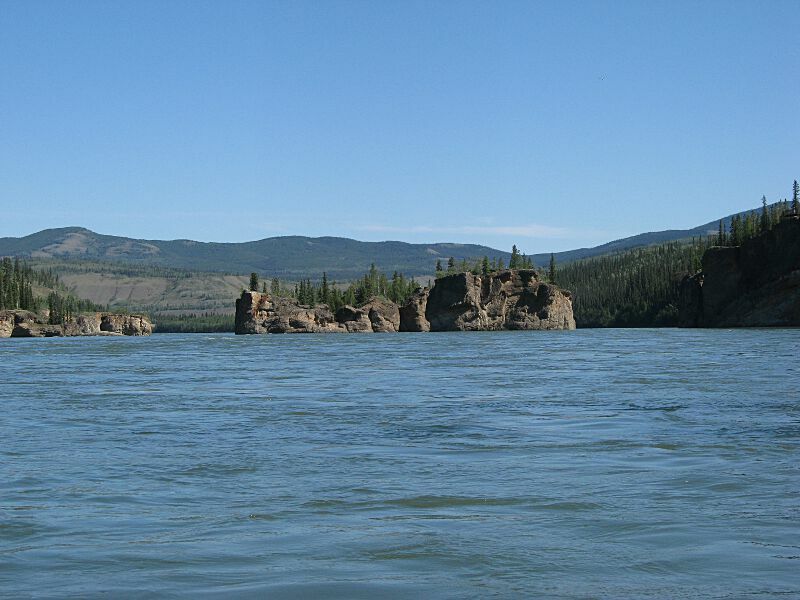 Between Whitehorse and Carmacks, camping spots are relatively plentiful along the river shoreline. Many of them are well marked by branches that can be seen from the river. All the ones we stayed at had flat spaces for tents and fire rings for cooking. In addition, they were well treed. Mosquitoes were an issue, but they were no worse than we are used to back home. We tried to stay at sites marked potential good camping on Mike Rourke’s maps and were not disappointed. 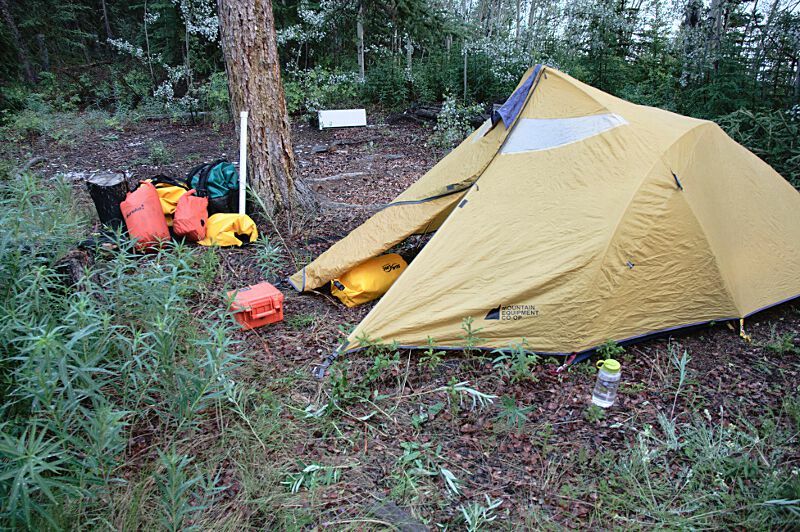 After Carmacks, there are far fewer treed camping sites, and the potential good camping marks on our maps disappeared. Instead look for sand bars on the upstream sides of the numerous islands. They are flat, easy to find, and free from mosquitoes. There were mosquitoes on shore. On the river, they didn’t seem to bother us. You want to have good bug spray with you, but I did not find the mosquitoes to be any worse then they are in my own back yard. We were advised to bring bug nets to cover our faces, which we did, but we did not use them once. The Yukon River is known to contain Beaver Fever, and it is advised that all drinking/cooking water be treated before use. The river became progressively more silty as we approached Dawson City, so filling up at the mouth of clear creeks feeding into the river was the best option. We stopped at creeks daily to fill up our water stores. We treated the water using a filter and pump from MSR, while Jananna used a chlorine treatment system. The chlorine system was a lot less work, but took a while to treat the water and left a chlorine taste behind. The pump/filter system was a lot more work, but the water tasted good and was ready to drink immediately. After two weeks on the river, none of us contracted any stomach bugs, so I guess both systems worked. We packed all of our own food for the entire two weeks with one exception: cheese. We stopped at Carmacks on day 7 and purchase a block of low fat cheddar cheese. Actually, two exceptions, we also split a hamburger at Carmacks for a completely unreasonable $20. Here’s a link to our meal plan if you want to take a look at what we ate. You’ll want to practice bear safety. This means cooking and storing your food away from your campsites, and making noise when you approach shore. Although there are plenty of bears, both Black and Grizzly, along this stretch of the river, bear attacks are rare. You can purchase a fishing license for $15-$35 depending on your country of residence. The most common fish are Arctic Grayling, Northern Pike (Jack Fish), and during certain times of the year Salmon. 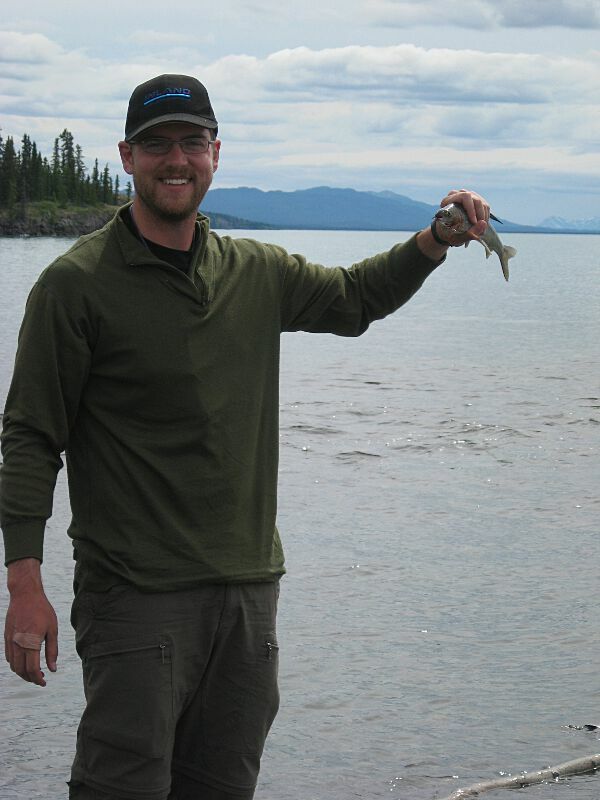 I tried my hand at catching Arctic Grayling. I had a fish on the first cast, and it did not take long to catch supper. That’s about all you need to know to arrange this trip for yourself. In part 3, we’ll post our unabridged journal and some more photos. It is unbelievable just what equipment you need to be fully prepared on an excursion of this type. Sign Post Forest looks particularly interesting….great picture. That’s the nice thing about taking a canoe. Lots of space. Compared to overnight hiking, this felt like luxury travel. I have to agree that canoeing is fantastically good, not only does it give you that sense of freedom, but you can experience the world from a different perspective, that being from a waterways perspective. Brilliant pictures and blog. Thanks for the positive feedback Joanne.